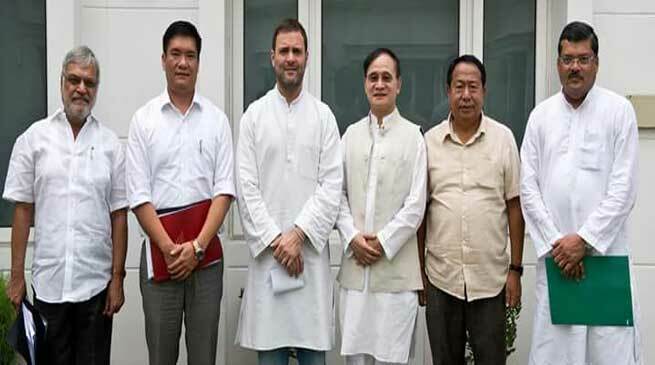 Arunachal CM Pema Khandu along with former Chief Minister Nabam Tuki and Arunachal Pradesh Congress Committee (APCC) President Padi Richo called on AICC President Sonia Gandhi and AICC Vice President Rahul Gandhi on Monday. The Arunachal delegation was accompanied by AICC General Secretary CP Joshi and his colleagues Mukul Wasnik (General Secretary) and Dr Jaykumar (Secretary). In the brief meeting, the AICC chief Ms Gandhi congratulated the newly elected Chief Minister and advised Mr Khandu to govern the state on the principles of equality, secularism and justice. The senior congress leaders also advised the Chief Minister and his team to adopt “inclusive development” and accord paramount importance to it. CM Khandu expressed his gratitude to the party high command for their support to his government and hoped for its continued support for effective implementation of all government policies and programmes to benefit the masses.